According to the Garland Encyclopedia of World Music, after the Battle of Culloden in 1746 where the Jacobite Rising, consisting largely of Scotsmen from the Highlands, was brutally crushed by forces loyal the British government, a ban on musical instruments was placed on the people of the Highlands. According to Garland and other sources, this is the predominant reason for the existence of one of the most enduring folk traditions of Scotland: port-à-beul (or puirt-à-beul), also known as “mouth music.” When no instruments were available, bards from the Highlands would sing for dancing, often imitating the rhythms and music of the bagpipes, using humorous and sometimes bawdy lyrics in a dancable rhythm. However, according to several present-day scholars, this story is utterly apocryphal and nothing more than unsubstantiated legend. Port-à-beul could be much older than 1746, and why not? Humans haven’t always had instruments at their disposal, and what would have kept them from inventing their own music? And there are similar styles in other European regions – lilting in Ireland, for example, and in Norway with a fiddle imitation known as tralling. Regardless, this legend is a nice lead-in to discuss a recording of real mouth music. Recordings of traditional music from England, Scotland, and Wales, are by far the exception than the norm. While the Gramophone Company of London was cavorting around the world recording all manner of peoples and cultures and exploiting new markets in the first half of the 20th century, the regional and folk music in their back yard went largely unnoticed. There are a number of important exceptions, of course. The Beltona label of Scotland recorded many folk bands and unaccompanied singers from the 1930s onward. People like Cecil Sharpe and Ralph Vaughn Williams helped to usher in a folk revival. 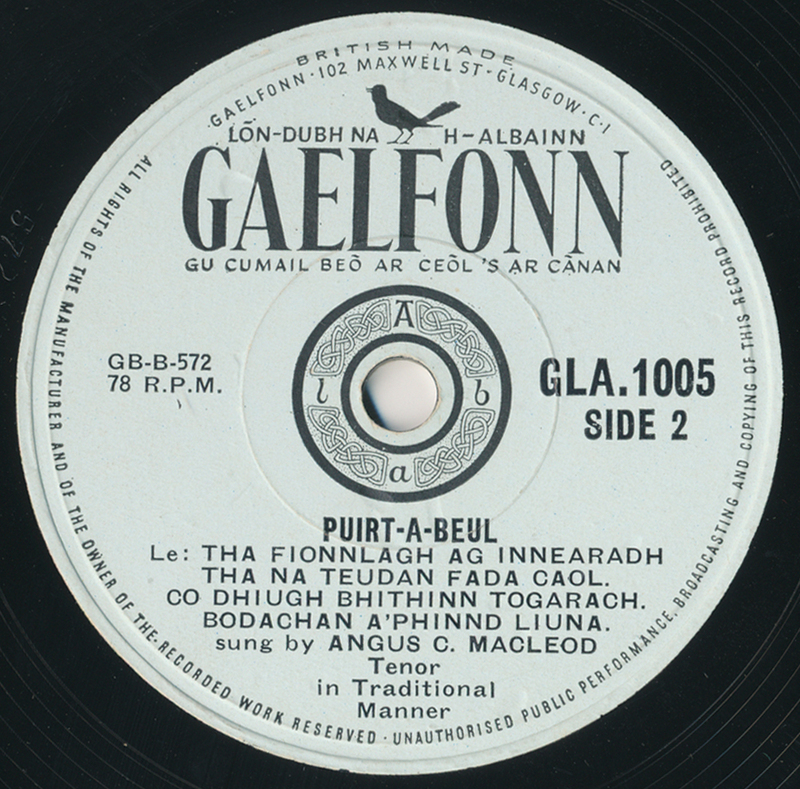 Carrying the byline “Lon Dubh Na H-Albainn” or “The Blackbird of Scotland,” the Gaelfonn label was in operation in the late 1950s, and had an office at 102 Maxwell Street in Glasgow. The outfit was run by a well-known Gaelic singer, Murdo Ferguson (1923-2005), who recorded performers on tape in Glasgow and had the records pressed in London. He also pressed Gaelfonn recordings on 45s and LPs as well (which might certainly be worth searching for, as clean Gaelfonn 78s are uncommonly noisy in my experience – an instance where limiting oneself to the 78 medium might solely be fetishistic). Angus MacLeod was born on the island of Scalpay in the Outer Hebrides (2001 population: 322) and died in 1970. Murdo Ferguson recorded several records by MacLeod ca. March of 1957. This piece is a medley of four different examples of mouth music. My Gaelic being virtually nonexistent, I cannot determine their order….yet I believe I hear the first piece, “Tha Fionnlagh Ag Innearadh” or “Finlay is Spreading Manure,” a little later in the recording than stated. Perhaps a Gaelic expert can chime in…in the meantime, enjoy. Thanks to Bill Dean-Myatt, Cormac O’Donoghue, and Ray Templeton. For another track by MacLeod, take a look at the new 2-CD collection by Fremeaux, 60 Years of Scottish Gaelic, put together by Scottish discographer Bill Dean-Myatt and Nigel Barrett (and from which I gathered some biographical information).